The cinema-going experience has transformed into an interesting ritual at this point. First, you buy your ticket, usually right before the movie starts, or you can buy it in advance. 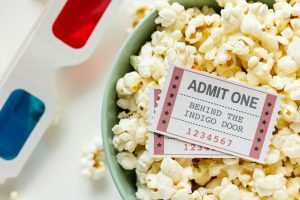 You arrive at the cinema a bit early, lest you miss the beginning of the movie, and you spend this time on observing upcoming movie announcements, and maybe proceeding to the concession stand where you may or may not choose to buy some snacks. After that, you quickly break at the restrooms to enjoy the next two or so hours uninterruptedly before settling into your seat in anticipation of the movie about to start. This ritual is very fixed and very natural in the mind of a standard moviegoer. But above all, it’s a predictable one. As such, it’s a great opportunity to enhance it with digital signage, since you know exactly how the target audience movies, behaves and thinks! Understanding them can help you guide them to any offer you might have for them aiming to make their experience even better. This is only one of the reasons why digital signage is a must for any cinema. Let’s take a look at all these reasons in more detail! If you're in the cinema industry, you surely know the value of profits from concessions. Since they are a vital part of covering the cost of leasing movies, it's important to make them as high-yielding as possible. This can indeed turn into a challenge, given that only 34% of moviegoers say they'll likely buy from the concessions. Digital signage can help raise that percentage and sell more popcorn! The general mentality is that you'll likely buy something if you think it will give you some value proportional to the money you spent. Digital signage can help convince the customer that their customer experience will be greater if they make a snack and drink purchase at the concession stand. Of course, digital signage can’t pull all the weight. Snacks and treats sold also need to match the consumer’s expectations. If Starbucks has taught us anything it’s that most spenders like custom offers tailored to their demands. If for nothing else than to merely stand out from the crowd. This is why concession stands at cinemas should switch up their offers based on time of day, for example, audience demographic and why not movie genre as well. Aim to provide special offers and product combinations to appeal to the specific audience more effectively. Traditional movie posters will never go out of style. They are evergreen collectibles. But there is something to be said about the effect they have on the audience. Sure, if you see a Star Wars sequel, you’ll likely be intrigued since you know of the many parts you’ve already seen before it. But when it comes to fresher movies, posters might not be that effective at convincing the audience it should be included on their must-see list. Digital displays used throughout the lobby of the cinema as well as outside can be excellent attention grabbers! And they can also convince the viewer they should buy a ticket. First, the movement and the illumination of the display attracts attention, and second, every movie has a trailer. Use it! It’s material just waiting to be utilized. And plenty of movies usually have teasers and scene highlights released specifically to intrigue the viewer. As we often say, digital signage is just a conduit, a channel which showcases the best things a business has to offer. Thus, it stands to reason it is only as good as the offer itself, and as its potential grows, many industries and businesses grow with it, cinema included. 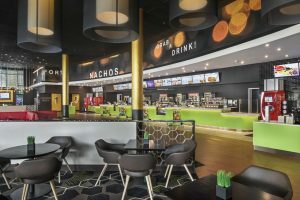 An excellent example of cinema growth can be seen in three New York theaters belonging to Showcase Cinemas which had quite a bit of work done. Starting with the lobby, the heart of every cinema, which got a refreshing redesign making it more sleek and modern. Also, digital signage was used to provide an "all-in-one" concessions experience. This allowed customers to purchase a variety of concessions in one transaction. Digital signage was thus used for a new Coke Freestyle machine. It offered an array of choices through an interactive touchscreen with Bluetooth connectivity. These cinemas went through a plethora of other upgrades as well. But it’s important to note the presence of digital signage. It is very fitting, if not the key component which simply couldn’t be excluded from such an upgrade. Keep in mind that some of the above-mentioned applications of digital displays aren’t really innovative anymore. In fact, cinemas quite frequently adopt them to enhance the customer experience. Digital signage in the lobby used for a variety of purposes has shown it works! And it’s becoming the norm of the modern cinema. Still, digital technology is yet to hit a wall, no pun intended. LED screens are starting to see adoption in cinemas, and replacing laser projection systems. As you might imagine, the cost of this sort of upgrade has prevented it from spreading too uninhibitedly. But it’s spreading nonetheless. We can see it through Samsung's push into digital cinema, which resulted in their Onyx LED screens being installed in cinemas across the world. The product in question is 14 meters wide and 3D-ready, promising to deliver even more vivid and realistic content. Cinema is yet another home for digital signage. In this day and age, it has become an integral part of the cinema-going experience. That is why it is ideal for any cinema, large or small, to utilize its capabilities. Although, upgrading from standard projectors to a massive seven-digit costing digital wall might not be a business move in the cards for all cinemas. A display or two in the lobby is a clever start! 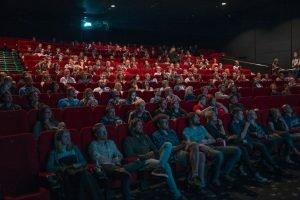 Additionally, if you would like to learn more, check out our article on some more digital signage uses in movie theaters!